Regular readers of this blog know that I am a baseball nut, so you can imagine how stoked I was to witness Roy Halladay throw a no-hitter Wednesday night. In retrospect, I'm glad the game wasn't on television in prime time so I could watch the historic game with my boys. As I wrote earlier in the week, we went to New York last month to see the Phillies beat the Mets on the road and were able to check out the gluten-free food stand at Citi Field. Also on the sports scene, a reminder that with the start of the new pro hockey and basketball seasons the Wells Fargo (formerly Wachovia) Center has gluten-free food and drink at the "Fan Favorites" concession stand, on the concourse level at Section 122. Congratulations to reader Jake M., whose name was selected as the winner of the Bisquick Gluten Free prize pack giveaway, and thanks to everyone who entered. New to the restaurant list this week is Ry's Bagels Cafe in West Berlin (255 Route 73 North, 856-210-6327). The shop has Udi's bagels and uses a dedicated toaster and separate utensils. Diners can also enjoy two varieties of Conte's gluten-free pizza. Another Seasons Pizza location has added gluten-free pizza. This one is the Elsmere location in Wilmington (1112 Kirkwood Highway, 302-994-4000). South Philadelphia's Black N Brew (1523 East Passyunk Avenue, 267-639-6070) now offers flourless banana and blueberry pancakes with shredded coconut. Main Line Pizza in Wayne (233 East Lancaster Avenue, 610-687-4008) has expanded its gluten-free menu beyond its namesake specialty to include pasta dishes and chicken wings, among other items. Coming soon will be homemade meatballs and chicken cutlets made with gluten-free breadcrumbs. Looking for healthier chicken nuggets? 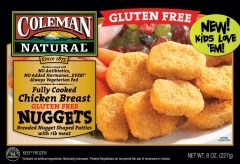 New to market are fully cooked Coleman Natural Gluten-Free Chicken Breast Nuggets, which are made with chickens that were fed a vegetarian diet and raised with no antibiotics, hormones or preservatives. A serving of six nuggets are 130 calories and six grams of fat (just one gram of sat fat). Readers in South Jersey can find these at ShopRite of Marlton. Fill out a product survey and get five dollar-off coupons for Coleman products. The nuggets themselves are small; we microwaved them and thought they were tasty. First came Oreo-style gluten-free ice cream sandwiches. Now, the sequel from Julie's Organic and Glutenfreeda Foods combines lemon-flavored frozen yogurt with vanilla cookies. Purely Elizabeth, a company started by holistic health counselor and native Philadelphian Elizabeth Stein, has debuted a line of gluten-free cookie mixes sweetened with hard-to-find organic coconut palm sugar. The new cookie line includes three inaugural varieties: chocolate chip, oatmeal cherry chocolate chip and oatmeal cinnamon raisin (the oats are certified gluten free). The cookie mixes expand the brand's established line of all-natural, organic baking mixes that are gluten free, certified vegan and free of refined sugar. This month's Gluten Free Delaware meeting has been rescheduled for this Sunday, October 10. It'll be held this time out at the Woodlawn Free Library, located at 2020 West 9th Street in Wilmington (a few minutes from I-95 Exit 7). Those planning to attend can RSVP through this link. The next meeting of the Greater Philadelphia Celiac Support Group will take place on Friday, October 22 at Abington Memorial Hospital (1200 Old York Road, Lenfest Building, Classrooms 1& 2). Doors open at 5:45 p.m. with a vendor fair; the meeting will begin at 7:30 p.m. Participating vendors include Cookies For Me, Good Eatz, The Grainless Baker, Grandma's Grotto, Main Line Baking Company, Sweet Freedom Bakery and Virago Bakery. Enjoy the weekend and go Phils!